Moratorium is a fantastic route in and of itself. 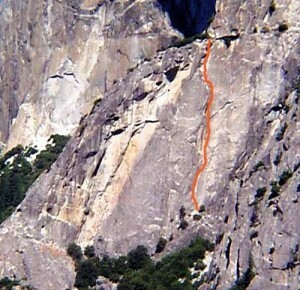 When linked with the East Buttress of El Cap (Moratorium tops out 40 feet from the start of East Buttress), it facilitates a proud tick and a great full day of climbing! The Moratorium deals sustained, clean pitches of classic Yosemite finger cracks, laybacking, technical stemming and just pure fun climbing. An easy approach with optional descents (rap or a glorious scenic walk along the east face of El Cap) makes this route fairly popular. The route faces east so take this into consideration during different seasons. Which SuperTopo guidebooks include a topo for Moratorium?